Walk to beach from Hawaii Sheffield House. Located just 10 houses from Kailua Beach the Garden Suite ($154-$209) has a queen bed and single bed sized sofa/with trundle and a delightful window seat which is also the size of a single bed. It has a private entrance and a private bath. The Garden Suite is a ground floor unit and has a one step entrance. There are ceiling fans in all of the rooms as well as quiet split system air conditioning. Sheffield House is located in a neighborhood only a short walk (10 houses) from secluded Kailua Beach - one of the best beaches on Oahu. Sunbathe or swim in the cool water or just walk on the white sandy beach. On breezy days watch the windsurfers, or look for sea turtles between Flat Island and Kailua Beach Park. Take advantage of waking up early from the time zone change and walk down to the beach to watch the sun rise out of the ocean over the Mokulua Islands. Or once a month check out the full moon rise out of the ocean. Bird watching is superior over the canal at Kailua Beach park or in Kawainui Marsh. See stilts, herons, or iwa birds. The Garden Suite entry area has a split rail barrel with a turtle fountain that bubbles away. The Garden suite features a water color print of a Hawaiian monk seal. It has a wicker and rattan furniture, queen futon It rents from $154-$204 per night for a party of two. $25 extra per person charge. At this time we are not taking children under the age of 3 in this unit . We do take small children in VRBO 572486. It has Mexican tile floors and Hawaiian quilts on the beds. The kitchenette in the Garden Suite has kitchen cabinets with granite counter tops, a half size refrigerator, hot plate, toaster, microwave, electric frying pay, and coffeemaker. It has an outdoor garden area with umbrella, table and 4 chairs . Towels, beach towels and paper towels are provided. Yes, we provide a hair dryer. A charcoal grill is provided for your use in the garden area. We offer extreme high speed internet and high definition cable TV. It has off street parking, phone, tv, and wifi. A complimentary breakfast of sweetbread, juice, fruit and coffee or tea, is provide for your first morning. Please note we are a non-smoking facility. Upon arrival you will meet Paul or Rachel Sheffield. Check in is 3 p.m. and check out is at 10 a.m. Late check out can be arranged with a 50% room fee. + Tax of total. There is a $25 per person extra person charge. $80 cleaning fee per room per week. A 50% deposit is required for a reservation. No refunds will be given unless the room is re-booked to others. Due to our residential area we have a quiet time between 10 p.m. and 6:30 a.m.
We love sharing our corner of paradise with our guests. The Ginger Studio VRBO 572484 also has a queen bed. Rented together both can sleep a total of 4 people in beds, plus 1 on the single daybed (with trundle) couch and a small child in the single bed sized window seat. :Kailua, Vacation Rental, Suite , Studio, Walk to Beach, Walk to Kailua town. Bed and Breakfast, Kailua Hotel, Kailua Motel, Oahu Motel, Oahu Hotel, Kailua Home, Kailua House, Hawaii Near Beach, Convenient to Kailua Whole Foods. Can Sleep 5 when rented with adjoining VRBO 572484. We have offered hospitality for over 30 years and love to share our corner of paradise. Paul Sheffield is an architect. Rachel Sheffield is a landscape architect and planner. Our three children are young adults who are in and out but are living on the mainland enjoying adventures and working in Utah/Ohio and California. Sheffield House's location is extremely convenient to walk to the beach, to Kailua town, or to drive into Honolulu. Click here to see how close we are to beach. https://tours.360aaa.net/public/vtour/display/906421#!/ An In the driveway parking space is definitely a plus. We have been offering vacation rental hospitality for over 30 years. (rainbow and white shower trees in the Garden which blooms from June - September. Yes, we are one of the few legal licensed bed and breakfasts in Kailua. Quiet split system units are in both units. We usually have trade winds make open window living very nice. Yes, bath towels, hand towels, beach towels and paper towels are provided. It is roadrunner . It is good and quite fast. The Garden Suite has a living/dining/ kitchen room. (2) 3/4 size refrigerator in the Garden Suite. It has a freezer compartment. Drip coffee maker is provided. plates, flat ware, knives, can opener, etc. suite has a kitchenette with all appliances except a full stove with oven. Indoor dining has a table and three chairs. Outdoor dining area in Garden area has a table and 4 chairs. A charcoal grill is also available for your use . Ask the host. We have a Hawaiian version of Monopoly . boogie boards and some beach toys are provided. 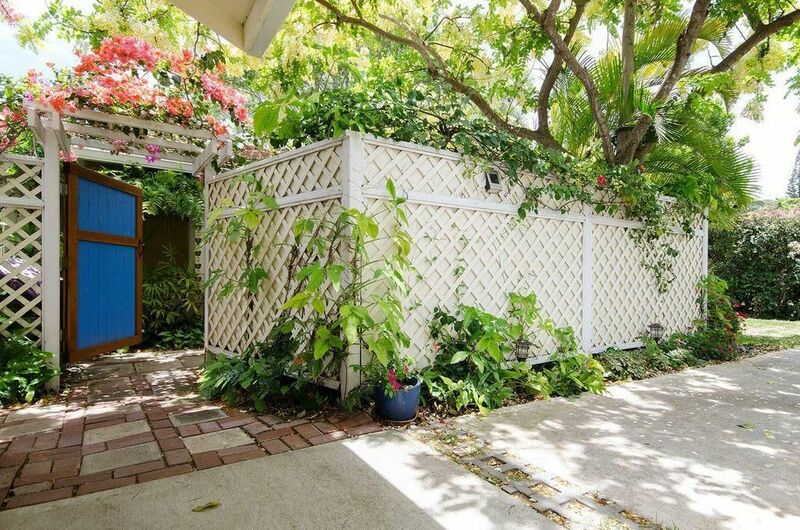 There is a garden area shaded by a white shower tree exclusively for the use of the guests in this unit. Garden Suite lanai is shaded by a white shower tree. Ginger Studio lanai is shaded by a kukui tree. Garden suite has an outdoor seating area for four. Aarons Dive Shop provides Dive and snorkel tours down the street in Kailua town. Midpac Golf Course is the closest . It is about 2 miles away. We are at ground level . There is no stairway to reach this unit. The doorways are too narrow for most wheel chairs. There are two large laundromats within 1/3 of a mile from Sheffield House. One laundromat is by the McDonalds. The other is across the street from Kailua Pub. They have large machines which make laundry time fast. There is a massage school 1/3 of a mile away in Kailua Town which offers discounted massages. Walk to Kailua beach 10 houses away or Kailua town in the other direction. Hawaiian quilts, beach chairs, and ceiling fans are provided. There is an Olympic size pool and exercise classes offered at the recreation center only 13 houses away.. We are one of the few legal, licensed bed and breakfasts in Kailua. This was our first time using VRBO and so glad we did. We came out here to visit family and didn't want to stay in a hotel. We came across the Sheffield House and decided to give it a try. It was perfect for us! It comfortably accommodates 4 but it was great for my husband and I. There is a private entrance with it's own patio which I absolutely love. The shower is a bonus because it's extra roomy. I truly felt super comfortable and would definitely recommend it. Lots of places to eat and shop local as well nearby. Thank you for your kind words. Please come again. Cute, clean and short walk to beach. Very comfortable accommodations with an excellent bed for a sound sleep. Easy walk to beach or town. Easy parking next to suite. We really enjoyed our four night stay in the Garden Suite. Directions were great, arrival simple, and everything just as described. The place was also immaculately clean and comfortable. Would definitely stay here again! Thank you for your kind words. Do come again. Very nice property that works well for two. Attractive garden, very short walk to Kailua Beach -- which is fantastic. We enjoyed the proximity to town & shopping, as well as several beaches! We are located between Kailua Beach and Kailua Town. There are tennis courts, basketball gym and outdoor courts and an Olympic sized pool (with a lifeguard) at the park only 13 houses toward Kailua town. Beautiful sandy Kailua beach is 10 houses in the other direction. A hike to the pillboxes (concrete lookout stations built in World War 2) over Lanikai gives a wonderful view of Kailua bay and the ocean. The Garden Suite usually rents for $174 per night. +25 per person over a party of two. If booking Christmas a 10 day booking is preferred. Preferably with both units booking together. The State of Hawaii Transient Accommodations Tax number is TA-137-360-9984-01 The City and County of Honolulu Bed and Breakfast License number is 90/BB-0077.